Also attending the meeting were representatives of central ministries and agencies: The Government Office, the National Assembly's Ethnic Council, the Office of the National Assembly, the Ministry of Labor, War Invalids and Social Affairs, the Ministry of Planning and Investment, the Ministry of Finance, the Ministry of Agriculture and Rural Development, Ministry of Industry and Trade, the Ministry of Science and Technology, Vietnam Chamber of Commerce and Industry. Representatives of leaders and specialists from Ethnic Committee unit; leaders of People's Committee and Ethnic Affairs of Dak Nong, Dak Lak, Gia Lai, Kon Tum and Lam Dong provinces. At the opening speech, the Minister and Chairman Do Van Chien had pointed out that the Central Highlands was a strategically important strategic area, a key area for the development of industrial crops with plentiful and diversity natural resources and also a place where many ethnic minority groups live. In recent years, in order to support the ethnic minority people in the Central Highlands, the Party and Government have invested in many big projects such as Program 135, the national target program for poverty reduction, building new rural areas, granting health insurance cards, housing land, production land, water for poor people ... However, due to many reasons, the situation of socio-economic development in the Central Highlands still faces many difficulties. Poor households rate in the ethnic minority areas are still high; Therefore, to help the Central Highlands, The Party and Government need to develop more solutions. 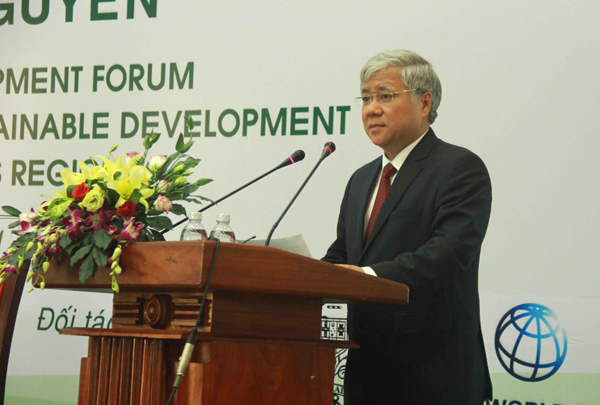 At the end of the forum, the Minister and Chairman Do Van Chien emphasized: Demand for investment in socio-economic development is really huge. In the current context, resources for implementing ethnic policies are increasingly difficult. Solutions for poverty reduction and sustainable development of EM people can’t be expected completely on the state budget. To develop the Central Highlands, we need to mobilize resources of the business community, socio-economic organizations, especially is the role of people, in which the focus is on cooperative solutions, connect with implementing policies of the State and the participation of investment, business of enterprises in order to create jobs for ethnic minority people in the area to get off poverty. According to the Minister and Chairman, ethnic minority people should approach with the support of the State, through policies to attract investment, support about land, tax exemption, vocational training, loan support, promote mining projects about potential such as land, industrial plants, medicinal plants, forests, cultural and tourist development, investment in processing establishments and high-quality products such as tea, coffee, pepper; Especially create distribution enterprises, connect the market with the people. With start-up projects in ethnic minority areas, the Minister and Chairman thinks that it is necessary to have private policies suitable with local conditions of different areas. Provinces should also guide the departments and agencies to develop small projects in the ethnic minority areas, review successful and unsuccessful models to learn experience from them. On the afternoon at the same day, the Minister and Chairman Do Van Chien and representatives attending the forum has visited the green farm model at village 10, Nam N'Jang commune, Dak Song district. This is a model of agriculture-forestry farm with an area of ​​52 hectares of afforestation and planting agricultural crops under the canopy of forest according to international standard clean technology. Employees are mainly ethnic minority people, they were trained to work in accordance with the model of agricultural development high technology.